From 9 to 14 April 2017, a joint World Heritage Centre/ICOMOS/IUCN Reactive Monitoring mission visited the World Heritage property of Natural and Cultural Heritage of the Ohrid region (the Former Yugoslav Republic of Macedonia. The report with findings from this mission is available at http://whc.unesco.org/en/list/99/documents/. The mission discussed with the authorities the overall state of conservation of the property and provided technical assistance on the scope and development of a SEA, which should comprehensively assess the potential individual and cumulative impacts of all above-mentioned projects on the Outstanding Universal Value (OUV) of the property. The 2017 mission concluded that some of the proposals for large-scale infrastructure and construction projects, such as sub-sections (a) and (e) of the A3 road and the Galičica ski resort within the property could lead to irreversible changes to the property, in combination with the developments and transformations that have already occurred in the urban settlements and lakeshore since its inscription. The mission strongly recommended to completely abandon the Galičica ski centre project, keep the internal national park zoning as is, and consider developing ecotourism options that would not negatively impact the property. 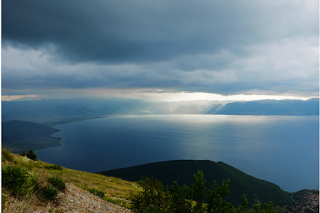 Therefore, it is recommended that the Committee request the State Party to halt the construction projects of the Galičica ski resort, as well as the sub-sections (a) and (e) of the A3 road. It is also recommended that the Committee reminds the State Party that all projects including those submitted to major donors such as the European Union which may have potential negative impacts on the OUV of the property, should be submitted to the World Heritage Centre and the Advisory Bodies for review in conformity with Paragraph 172 of the Operational Guidelines. Considering the level of threats to the property, the mission identified a set of recommendations, some of which need to be prioritized and fulfilled over the next two years, in addition to those adopted in 2016 that still need to be fulfilled. The findings of the mission suggest that the overall state of conservation can be considered as vulnerable, and if the priority recommendations are not implemented within the suggested two-year time frame (i.e. in 2019), the property may meet the criteria for inscription on the List of World Heritage in Danger. It is therefore recommended that the Committee request the State Party to submit, by 1 February 2018, a progress report on the implementation of these priority recommendations for review by the World Heritage Centre and the Advisory Bodies. If in their assessment insufficient progress is being made, the property will be examined by the Committee at its 42nd session in 2018. A three day course on "Heritage, driver for sustainable development in LakeOhrid region" took place in Pogradec, Albania from 25-27 April 2017. 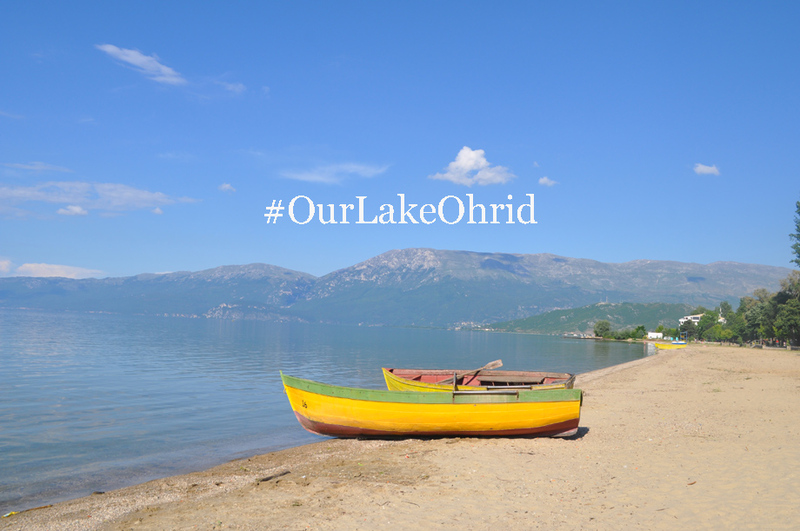 25 people from two countries working and living in different areas of Lake Ohrid region participated. The training course aimed at Increasing appreciation of shared heritage values and building awareness on the potential of heritage, both cultural and natural, as a support for sustainable development among small-scale entrepreneurs and sharing knowledge on how to build and sustain successful micro-enterprise based around the values of the area. The second day, was organized as a forum with representatives from Municipality of Pogradec, which took answers from participants related to opening a new business, knowledge about the taxes, how to be friendly with environment around Lake Ohrid. After the meeting, participants had the chance to visit some small local business. The first visit was in one of the oldest pastry 'Shop in Pogradec' producing an authentic “llokum” a dessert made with corn flowers, sugar, powdered sugar, gelatin and rose flavored water. The shop dates from 1930 opened by his grandfather a former immigrant in Istanbul. The recipe is inherited in generations. 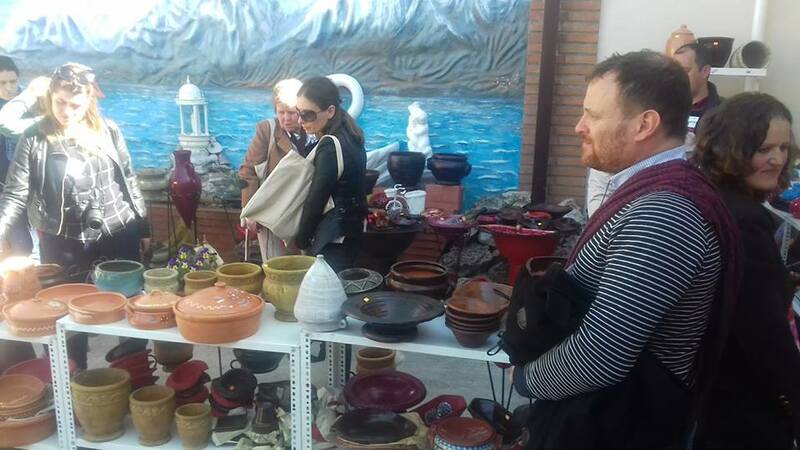 A small fair was organized near the promenade in the center of Pogradec with local food and art-crafts. Artisan women presented their work alongside the promenade in an open fair. Some local specialties like lakror, byrek and revani cooked by some women was served for buffet-dinner to participants and other guests invited from Municipality and NGO-s acting in Pogradec. Mr. Avdulla Cano, Vice mayor of Pogradec Municipality congratulated the project for the series of training and work done aiming to include Albanian part of Lake Ohrid in UNESCO Heritage List, while UNESCO representative, Ms. Alexandra Fiebig thanked participants, artisans and municipality for the support. The next stop was in old shop of wood carving where the aged-man welcomed the group with a big smile, sitting in his chair. 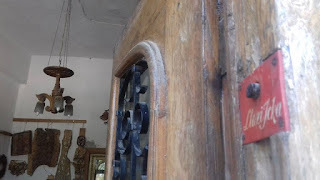 The three-floor house was decorated and filled with art-works in wood. It was amazing to see the walls of the mall shop full of wood carving; each one a piece of art. 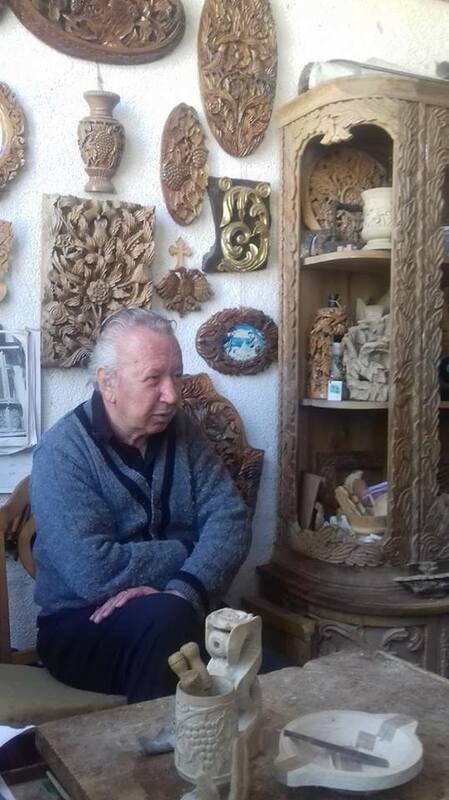 Mr. Llazi Icka has been carving small and large wood pieces for over 60 years in his small studio in Pogradec, southeastern Albania. His detailed carvings are worth examining closely and he does it more for passion rather than for living. For some items he couldn’t even tell the price and for some others he wouldn’t sell at all. He pointed out that his daughter and his son are both excising in this. The façade on the back was also made of wood. After this amazing visit the group headed to Tushemisht to visit two other small businesses; fish farm and pottery shop. It was a nice trip for 10 participants riding bikes kindly offered by a local operator visit-pogradec.com. The ride through a nice road covered with greenery and shadowing trees was a great experience. On the Third day of training, each group prepared the business plan on these topics: recreation and tourism, traditional craftsmanship, Eco-environmental services and heritage enterprises/agriculture, forestry. The jury evaluated the presentation and chose as a winner one group. 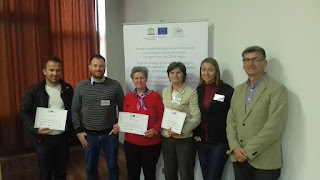 At the end of the training course participants received a Certificate of Attendance”, organized in the framework of project "Towards strengthened governance of the shared transboundary natural and cultural heritage of the Lake Ohrid region" co-funded by EU and Government of Albania. Every year Lonely Planet puts out their new book Best In Travel. For 2017 the little-known city of Ohrid in Macedonia sneaks in at number five, renowned for its position overlooking an extraordinary blue lake. Overlooking the extraordinarily blue waters of its eponymous lake, Ohrid enjoys a stunning position that is best viewed from a boat. From the water you’ll see the town’s terracotta roofs broken up by centuries-old church spires (the city claims once to have had 365) and overlooked by the turreted walls of Car Samoil’s Castle. 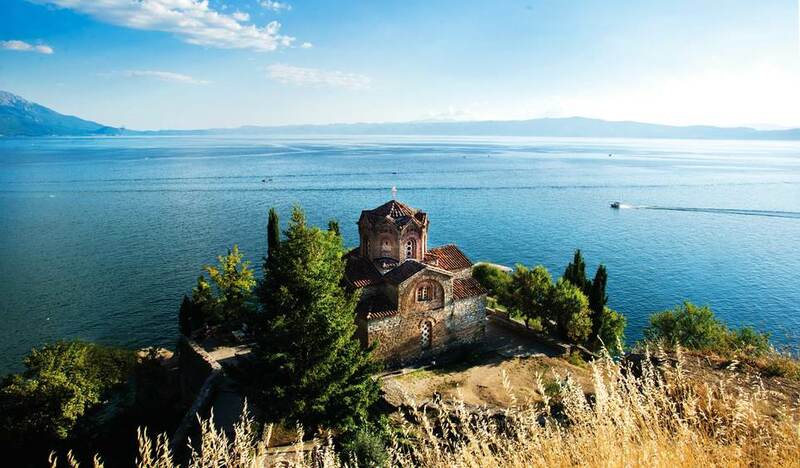 Ohrid has transformed itself from Macedonia’s religious centre to its busiest holiday resort, and its beaches are the best by far in this otherwise landlocked nation. However, a planned new lake-shore development will likely change this sleepy town forever, making now a great time to go.